A friend turned me on to the Vegetti and zoodles. I’m kind of impressed with zucchini noodles. In the past, I have tried replacement pasta options. But my issue was just that, I was looking for a replacement for pasta. Nothing is going to replace pasta. However, in it’s own right Spaghetti Squash and Zucchini Noodles (Zoodles) are great! Just don’t think you’re replacing something. Enjoy the noodles for their own characteristics, respectively. This Avocado Cream Sauce is amazing. I was skeptical. I am no longer skeptical. I’m a fan. Peel and prepare the zucchini using your choice of spiralizer (I use the Vegetti). Plate in a shallow bowl. 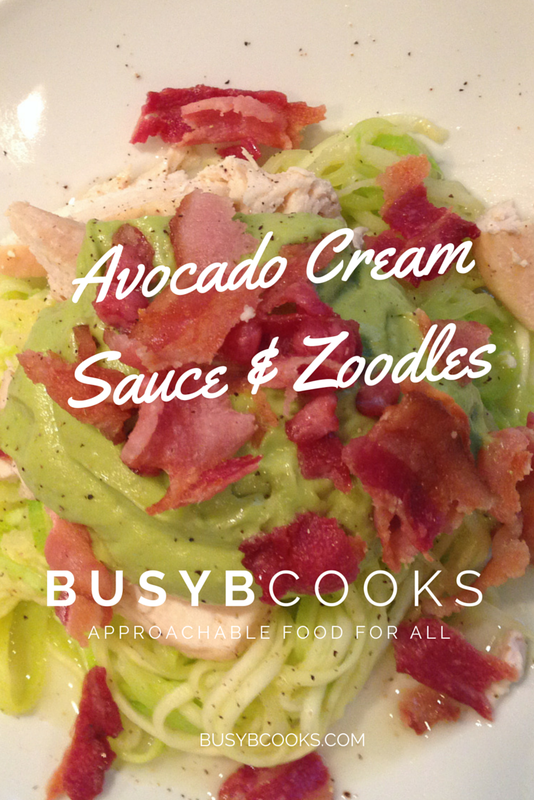 Zoodles topped with chicken, next dollop a generous amount of avocado cream sauce, and finish with bacon pieces.